This page will show you how to make additional gocomboakea53 on some tricks we can do. 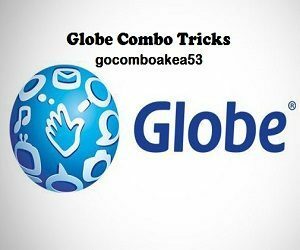 There are many tricks for the combo promo of the Globe and other providers today in the Philippines. You can check it now below. Send GOCOMBOIKEA48 to 8080 for additional 1 GB consumable data. (Add P48). Other options for additional 1GB: GOTSCOMBOKEA37 / GOTSCOMBOAEA37 / GOCOMBOAKEA53. Done. Send GOSAKTO STATUS to 8080 to check your 1.02GB data. For additional 1GB consumable data, send GOCOMBOIKEA48 to 8080. (Add PhP48) Other options for additional 1GB: GOTSCOMBOKEA37 / GOTSCOMBOAEA37 / GOCOMBOAKEA53. Send GOSAKTO STATUS to 8080 to check your data balance. Send GOCOMBOGKEA57 to 8080 and wait for the confirmation. Deducted of PhP57) using the GOCOMBOGKEA57 globe promo. Send GOCOMBOIKEA48 to 8080 for additional 1 GB consumable data. (Add PhP48). Other options for additional 1GB: GOTSCOMBOKEA37 / GOTSCOMBOAEA37 / GOCOMBOAKEA53. That’s all I know for the Globe provider on their promo GOCOMBOAKEA53 GOTSCOMBOKEA37 / GOTSCOMBOAEA37 / GOCOMBOAKEA53 tricks, and etc. that works on some combination as additional. I hope it helps.